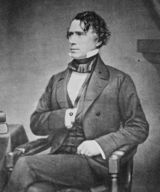 Franklin Pierce, Sr. ( November 23, 1804 – October 8, 1869) was an American politician and the 14th President of the United States, serving from 1853 to 1857. Pierce was a Democrat and a "doughface" (a Northerner with Southern sympathies) who served in the U.S. House of Representatives and Senate. Later, Pierce took part in the Mexican-American War, becoming a brigadier general. His private law practice in his home state, New Hampshire, was so successful that he turned down several important positions. Later, he was nominated for president as a " dark horse" candidate on the 49th ballot at the 1852 Democratic National Convention. In the presidential election, Pierce and his running mate William R. King won in a landslide, beating Winfield Scott by a 50 to 44% margin in the popular vote and 254 to 42 in the electoral vote. He became the youngest president up until that time. 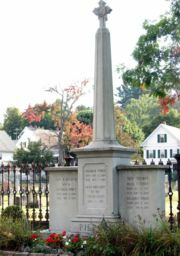 Pierce attended school at Hillsborough Centre and moved to the Hancock Academy in Hancock at the age of 11; he was transferred to Francestown Academy in the spring of 1820. Later that year he was transferred to Phillips Exeter Academy to prepare for college. In fall 1820, he entered Bowdoin College in Brunswick, Maine, where he participated in literary, political, and debating clubs. In his second year of college, his grades were the lowest in his class; he shaped up and graduated in 1824, third in his class. After graduation, in 1826, he entered a law school in Northampton, Massachusetts, studying under Governor Levi Woodbury, and later Judges Samuel Howe and Edmund Parker, in Amherst, New Hampshire. He served in the House from 1829 to 1833, and as Speaker from 1832 to 1833. Pierce was elected as a Democrat to the 23rd and 24th Congresses ( March 4, 1833 – March 4, 1837). He was only 27 years old, the youngest representative at the time. On November 19, 1834, Pierce married Jane Means Appleton, the daughter of a former president of Bowdoin College. Appleton, who was born in 1806 and died in 1863, was Pierce's opposite. She came from an aristocratic Whig family and was extremely shy, deeply religious, often ill, and pro- temperance. 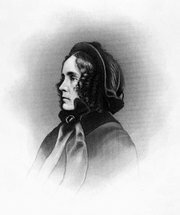 Mrs. Pierce hated life in Washington, D.C., and encouraged Pierce to resign his Senate seat and return to New Hampshire, which he did in 1841. They had three children who all died in childhood. 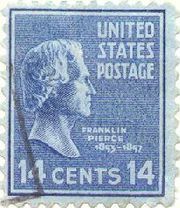 Franklin Pierce, Jr. ( 1836- 1836), Frank Robert Pierce ( 1839– 1843) died at the age of four from epidemic typhus, Benjamin "Bennie" Pierce ( 1841– 1853) died at the age of 11 (or 12) in a tragic railway accident in Andover, Massachusetts which his parents witnessed, two months before the inauguration of his father. None of them lived to see their father become president. The Democratic Party nominated Pierce as a " dark horse" candidate during the Democratic National Convention of 1852. The convention assembled on June 12 in Baltimore, Maryland, with four competing contenders— Stephen A. Douglas, William Marcy, James Buchanan and Lewis Cass — for the nomination. Most of those who had left the party with Martin Van Buren to form the Free Soil Party had returned. 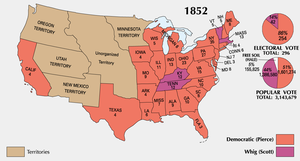 Prior to the vote to determine the nominee, a party platform was adopted, opposing any further "agitation" over the slavery issue and supporting the Compromise of 1850 in an effort to unite the various Democratic factions. Pierce's opponent was the United States Whig Party candidate, General Winfield Scott of Virginia, whom Pierce served under during the Mexican-American War, and his running mate, Senator (and later Governor) William Alexander Graham of North Carolina. Pierce easily prevailed as Scott — nicknamed Old Fuss and Feathers — ran a blundering campaign. The family had already lost two children to typhus, and Jane Pierce believed the train accident was divine punishment for her husband's acceptance of the high office of the presidency. As a result, Pierce chose to " affirm" his Oath of Office on a law book rather than the Bible, becoming the first president to do so. Pierce is one of only three presidents to affirm the Oath of Office, the two other being Herbert Hoover, who chose to "affirm" rather than "swear" because of to his Quaker beliefs, and John Tyler. In his inaugural address, he proclaimed an era of peace and prosperity at home and vigor in relations with other nations, saying that the United States might have to acquire additional possessions for the sake of its own security and would not be deterred by "any timid forebodings of evil." Meanwhile, Pierce lost all credibility he may have had in the North and in the South and was not renominated. After losing the Democratic nomination, Pierce reportedly quipped "there's nothing left to do but get drunk" (quoted also as "after the White House what is there to do but drink?") which he apparently did frequently. He once ran over an elderly woman while driving a carriage. During the Civil War, Pierce further damaged his reputation by declaring support for the Confederacy, headed by his old cabinet member Davis. One of the few friends to stick by Pierce was his college friend and biographer, Nathaniel Hawthorne.